Optical access services as access systems have grown widespread in recent years. Today, fiber networks come in many varieties, depending on the termination point: premise (FTTP), home (FTTH), curb (FTTC) or node (FTTN). For simplicity, most people have begun to refer to the fiber network as FTTx, in which x stands for the termination point. As telecommunications providers consider the best method for delivering fiber to their subscribers, they have a variety of FTTx architectures to consider. Since the long back, telecommunications providers have dreamed of an all-fiber network. and for good reason a Fiber provides substantially more bandwidth, carries signals farther, is more reliable and secure, and has a longer life span than any other transmission medium. Additionally, providers view fiber’s bandwidth capacity as a competitive weapon, particularly in the access network. Never before has the access network been as important to telecommunications providers as they look for ways to deliver new high-bandwidth services to their subscribers—services that generate new revenues, help them retain existing customers, attract new ones and increase profits. Fiber is seen as the preeminent long-term alternative to today’s broadband access technologies, one that not only allows providers to generate new services, but also provides them with significant and sustainable reductions in operating expenses and shifts their capital spending from older technologies to newer, less costly technologies. The single greatest driver for fiber in the access network is “multi-play” services, the opportunity to offer subscribers high-speed data, voice, and video as one of a variety of potential bundled services. The subscriber market for multi-play is large and growing and includes both residences and businesses. Businesses need more bandwidth and many of the advanced services that only fiber can deliver, and Multi-play offers homeowners the convenience of voice, data and video from a single vendor and on a single bill. All view Multi- Play as a strong competitive service offering now and into the future and are looking at fiber as the way to deliver. As traditional telecommunications providers explore their fiber network options, many municipalities and utilities are taking the lead, building green field fiber networks to serve their communities and to attract new business. Today, fiber networks come in many varieties, depending on the termination point: premise (FTTP), home (FTTH), curb (FTTC) or node (FTTN). For simplicity, most people have begun to refer to the fiber network as FTTx, in which x stands for the termination point. As telecommunications providers consider the best method for delivering fiber to their subscribers, they have a variety of FTTx architectures to consider. Currently, there is not a one-size-solves-all architecture, so providers must make a series of technology decisions based on their service goals. A primary consideration for providers is to decide whether to deploy an active (point-to-point) or passive (point-to-multipoint) fiber network. Optical fiber cables have conventionally been used for long-distance communications. However, with the growing use of the Internet by businesses and general households in recent years, coupled with demands for increased capacity such as for the distribution of images, the need for optical fiber cable for the last mile has increased. The FTT in FTTx stands for Fiber To The. How the fiber cable is to be used determines what will replace the letter x. e.g. x-H (Home), x-B (Building), x-C (Curb) etc. FTTH, FTTB, and FTTC each have different configurations and characteristics. A method of installing optical fiber cable to the home. FTTH is the final configuration of access networks using optical fiber cable. FTTH consists of a single optical fiber cable from the base station to the home. The optical/electrical signals are converted and connection to the user’s PC via an Ethernet card. Optical fiber cable is installed up to the metallic cable installed within the building. A LAN or existing telephone metallic cable is then used to connect to the user. A method of installing optical fiber cable by the curb near the user’s home. An optical communications system is then used between the remote unit (optical signal/electrical conversion unit) installed outside (such as near the curb or on a telephone pole) from the installation center. Finally, coaxial or other similar cable is used between the remote unit and user. When deciding which architecture to select a provider has many things to consider including the existing outside plant, network location, the cost of deploying the network, subscriber density and the return on investment (ROI). Active architectures sometimes referred to as Home Run Fiber and/or Active Star Ethernet, and passive architectures, which include Passive Optical Networks (PONs), are the current choices. Each has its own pros and cons, and the final selection will depend on the provider’s unique requirements. 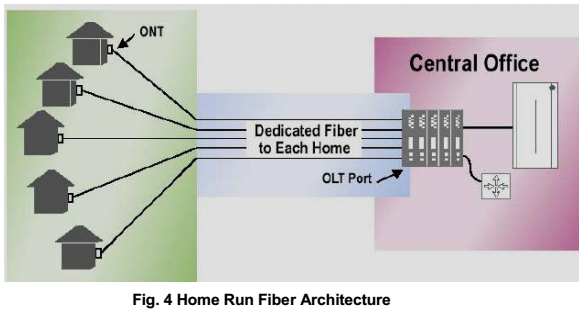 A Home Run Fiber architecture is one in which a dedicated fiber from an Optical Line Terminal (OLT) unit located in the Central Office (CO) connects to an Optical Network Terminal (ONT) at each premise. Both OLTs and ONTs are active, or powered, devices, and each is equipped with an optical laser. Subscribers can be located as far away from the CO or OLT as 80km, and each subscriber is provided a dedicated “pipe” that provides full bi-directional bandwidth. Over the long term Home Run Fiber is the most flexible architecture; however, it may be less attractive when the physical layer costs are considered. Because a dedicated fiber is deployed to each premise, Home Run Fiber requires the installation of much more fiber than other options, with each fiber running the entire distance between the subscriber and the CO. The fiber cost and size of the fiber bundle at the OLT can make this network expensive and inconvenient in many service areas.